In 1988, James Hansen first warned about the dangers of climate change when he testified before (the US) Congress. At the time he was NASA’s top climate scientist. He would go on to become the nation’s most influential climate scientist. This year he is making his first appearance at a U.N. climate change summit. He has come to Paris to warn world leaders that they are on the wrong track to prevent dangerous global warming. “AMY GOODMAN: We’re broadcasting from COP21, from the 21st Conference of Parties, that is the U.N. Climate Summit in Paris, France that is supposed to lead to the Paris Accord. As we turn now to NASA’s former top climate scientist, James Hansen. In 1988, Dr. Hansen first warned about the dangers of climate change when he testified before Congress. He would go on to become the nation’s most influential climate scientist. This year he is making his appearance at a U.N. climate summit. He has come to Paris to warn world leaders that they’re on the wrong track to prevent dangerous global warming. 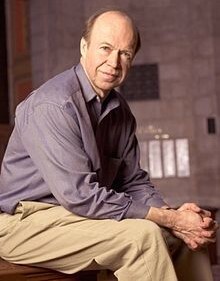 James Hansen joins us now, the Director of Climate Science at Columbia University’s Earth Institute. Welcome back to Democracy Now! It’s great to have you with us. JAMES HANSEN: Thanks for having me. GOODMAN: So, you wrote a piece in the Guardian saying, we’re at the point, now, where temperatures are hitting the one centigrade mark. You said, the U.N. is on the wrong track with plans to limit global warming to two degrees Celsius. HANSEN: Yeah, absolutely. This is really a total fraud. You know, there’s no – we’re not going to reduce emissions as long as we let fossil fuels be the cheapest form of energy. There are lots of countries that want to lift their people out of poverty. And of course, they should do that. But everybody would be better off if the price of fossil fuels was honest. It should include its cost to society. GOODMAN: So what is the plan here? And you’re coming in, interestingly, as an outsider. You have never been here before. GOODMAN: Which gives you an interesting perspective. HANSEN: Remarkable, it’s not much different than Kyoto except that, here, they’re not even requiring any connection among the different countries. They’re just saying, well, each country tells us what you’re going to do to reduce your emissions. And at the same time, they allow fossil fuels to be the cheapest energy, and appear to be the cheapest energy. Of course, they’re not, really, if you include their cost to society – and that’s what we should do; we should add a rising fee to the fossil fuel price. It would be very easy to so at the domestic mine or port of entry, a very small number of places. But we’re, instead, we’re just saying, well, let’s try harder. We’ll, you know, we’ll give you a plan. We’re going to reduce our emissions. Although, some countries are not – don’t even saying that. GOODMAN: What did you make of President Obama’s speech on Monday here at the U.N. Climate Summit? HANSEN: Well, we have to decide, are these people stupid or are they just uninformed? Are they badly advised? I think that he really believes he’s doing something. You know, he wants to have a legacy, a legacy having done something in the climate problem. But what he is proposing is totally ineffectual. I mean, there are some small things that are talked about here, the fact that they may have a fund for investment and invest more in clean energies, but these are minor things. As long as also fuels are dirt cheap, people will keep burning them. GOODMAN: So, why don’t you talk, Dr. James Hansen, about what you are endorsing, a carbon tax. What does it mean, what does it look like? HANSEN: Yeah. It should be an across-the-board carbon fee and in a democracy, it’s going to – the money should be given to the public. Just give an equal amount to every – you collect the money from the fossil fuel companies. The rate would go up over time, but the money should be distributed 100 percent to the public; an equal amount to every legal resident. GOODMAN: Is Alaska an example of this? HANSEN: Well, Alaska is giving fossil fuel money to the public, and of course they like that. So, it’s sort of – it shows how much the public does getting a monthly check. But what this would do, those people who do better than average in limiting their fossil fuel use, would make money. Wealthy people, people who fly around the world a lot and have big houses, they would pay more in increased process than they would get in their monthly dividend. GOODMAN: Explain what you mean. HANSEN: Well, because – we’re giving all of the money. You collect money from fossil fuel companies and you distribute it equalled all residents. So the one who does better than average and limiting his fossil fuel use will get more in the dividend than he pays in increased prices. GOODMAN: And how do you know what fossil fuel use is? HANSEN: Nobody has to think about this. They know. They will just look at prices. Of course, the price at the pump is obvious and the electricity bill will be obvious. This will move industry and businesses to develop no carbon and low carbon energies and products that use little fossil fuels. In fact, the economic studies show that United States, after 10 years, emissions would be reduced 30 percent because you have the economy forcing you in the right direction. But as long as you just leave it fossil fuels cheap, you’re not going to fundamentally change things. GOODMAN: - far more than any kind of renewable. There is a present debate on how to pin a cost on the impact of climate change. Included in these measures are: “carbon credits”, “carbon fee”, “climate financing”, “carbon tax”, “green bond”, “jet fuel tax”, etc. All of these financial initiatives are aimed at penalizing the larger carbon emitting countries while using such funds to help developing and underdeveloped countries mitigate the effects of climate change and their efforts to convert and develop renewable energy alternatives. Carbon fee, as James Hansen suggested, may just be another financial measure to curb global warming and climate change. But if this (and other suggestions) falls on deaf ears, it will be nothing more than just an idea from a different perspective.